This review was originally posted on May 23, 2016 and is being re-posted because the book has recently been issued in paperback. And because I think you should read it. 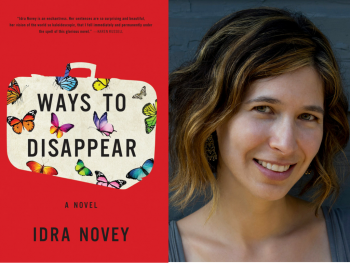 Ways to Disappear, poet and translator Idra Novey’s debut novel, is an absorbing exploration of the dichotomy between the perception and reality of a writer’s life. Novey’s protagonist, Emma Neufeld, translates the novels of the critically acclaimed Brazilian writer Beatriz Yagoda. But Emma is more than just professionally engaged in Yagoda’s work; she is obsessed with her writing and intrigued by her personal life. When she learns that Yagoda has disappeared, she is convinced she knows what makes Yagoda tick in a way no one else does and can help find her. She flies from Pittsburgh to Brazil to help Yagoda’s suspicious daughter, Raquel, and charming son, Marcus, search for her and discover why she went into hiding. But, as you might expect, young and naive Emma encounters an even greater mystery in Brazil itself and ultimately learns that there is both more and less to Yagoda’s work than she could have imagined. Novey, who translates works in Portuguese and Spanish (including the work of Clarice Lispector), has concocted a savory Brazilian dish that puts literary traditions as diverse as noir, magical realism, and romance to use in clever and surprising ways. Update: Ways to Disappear won the 2016 Brooklyn Eagles Literary Prize for Fiction and was a Barnes & Noble “Discover” selection. NPR named it one of the Best Books of 2016 and it was a New York Times Editors’ Choice. The book is currently a finalist for the Los Angeles Times Book Prize in First Fiction, which will be awarded at the Times’ Festival of Books on April 21. I definitely like the sound of this story and I’m immediately curious as to where and why the author disappeared and whether the translator will be successful in finding her.